Third grade students used picture book characters as inspiration for their poetry writing in celebration of National Poetry Month. I selected picture books with strong characters and randomly assigned them to small groups of students. Using a template, the students read the book and decided who would be the subject of their poem. We emphasized using text evidence for their writing. If you are going to say the character “sees” something, be sure that you can point to the evidence. This template could also be used as book report. The second library visit was used to finish up with those groups who hadn’t filled in all the lines or who needed some help editing. The third library visit I video taped the groups reading their poems and I used Windows Movie Maker to create a movie, which I uploaded to YouTube. Shared the links with the teachers so that the students could view the finished product. One more class needs to be taped and now that the craziness of state testing is over, I might get to it! Class watching their video of poems on YouTube. We celebrated National Poetry Month with all grade levels. 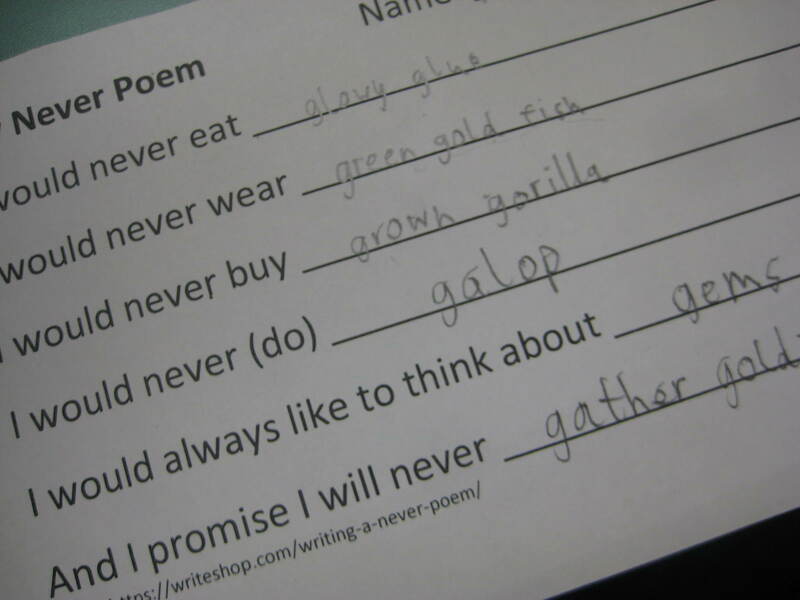 Second grade students wrote a “Never” poem which features repetition and alliteration. We used a template I found on WriteShop.com (https://writeshop.com/writing-a-never-poem). The students used dictionaries & thesauri to find words if they got stuck for ideas. 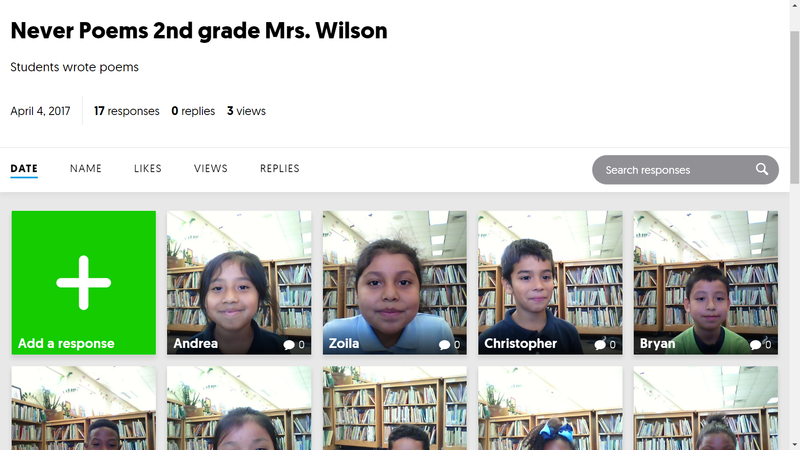 I used Flipgrid so the students could record themselves reading their poem. 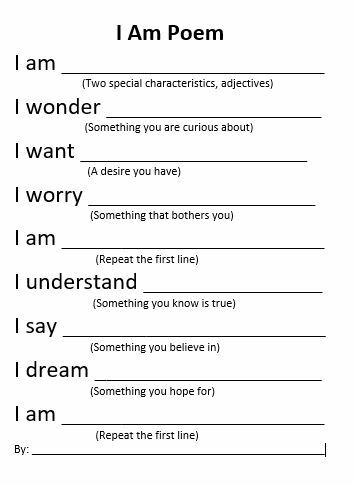 This gives them an authentic audience and practice reading aloud. I also shared this on the school’s Facebook page to further widen the audience and let parents see what their children are doing. 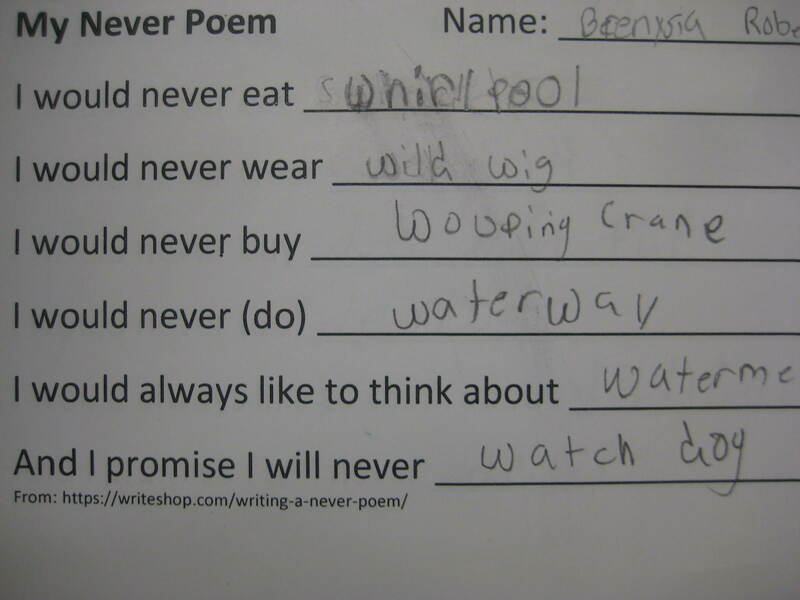 Second grade students created poems for National Poetry Month using a template (https://writeshop.com/writing-a-never-poem) for a “Never Poem” which emphasizes repetition and alliteration. We discussed what poetry was and some of the characteristics of poems. I modelled the writing using a white board and let the students help me think up words (all starting with the same consonant). Then we talked about adjectives and added adjectives to describe the nouns we had chosen. I had dictionaries and thesauri at the tables to help them find words if they were drawing a blank; this also served as a review for these reference sources.